When she was appointed by Governor David Paterson to replace Hillary Clinton, NY Senator Kirsten Gillibrand was known as a moderate or even a conservative Democrat. But that was because she was the Congressional Rep. for NY-20 an upstate district that is more conservative than NYC and Long Island. 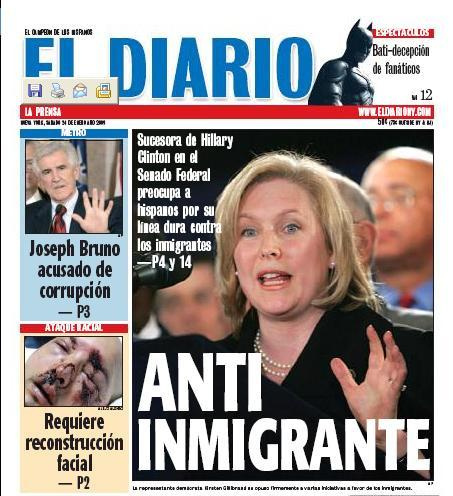 Gillibrand won her upstate New York district by running to the right: the Senator campaigned against amnesty for illegal immigrants, promised to restore fiscal responsibility to Washington, and pledged to protect gun rights. After winning by six points, she joined the conservative-leaning Blue Dog Coalition. When Patterson was considering her for Senate, The Daily Beast described Gillibrand as “a bizarro version of Sarah Palin” “who proudly touts her 100 percent rating from the National Rifle Association.” But once she was free of the shackles of representing a moderate/right district, Sen. Gillibrand turned out to be a spineless hack who changes her stance every time the direction of the wind shifts. But the direction of the winds shifted, and the Democratic Party became the no borders liberal party, therefore, so the spineless Gillibrand gave up her original position and took a giant step leftward. It is true that in 2006 Gillibrand promised to protect gun rights. In fact, when she was appointed to the Senate in 2009, she got heat from fellow NY Democrats because of her gun stance. Of course, like every other position of hers, that changed as the Democratic Party was taken over by progressives who hated guns. After the horrible shooting at the Capital Gazette newspaper last June, Gillibrand appeared on CNN and called for a ban on every type of gun but the weapon used by the shooter. In response to the Annapolis shooting, Democrat Senator Kirsten Gillibrand says that assault weapons, bump stocks, and high capacity magazines need to be banned. When she was questioning Chuck Hagel during his Senate Armed Services Committee confirmation hearings in 2013, she asked more questions about Hagel’s horrid history of trashing Israel than anyone else on the committee. She attacked his anti-Israel positions so many times, even an Israel advocate like me felt terrible for the guy– and I didn’t want him confirmed. Beginning with her opening statement practically every question/statement she made emphasized the importance of the Jewish State to America. Per the committee transcript Senator Gillibrand spoke 597 words in questioning Hagel, 381 of them (64%) were very pro-Israel directed questions or statements. That same year when speaking on a panel with John McCain at the 2013 AIPAC conference, she agreed with McCain that there should be no daylight between Israel and the United States on Iran. But as Obama led the liberal/progressive wing of the Democratic Party toward being more open about their anti-Israel, Gillibrand moved with the progressives. The first indication was when she decided that it was okay for the US and Israel to have daylight between them on Iran by ignoring her constituents and supporting the Iran deal. She even endorsed a filibuster so the Iran deal couldn’t be voted on by the Senate and their support recorded. Gillibrand began to move even closer to the positions of the progressive anti-Israel wing running the Democratic Party. She voted against the nomination of New York’s own, David Friedman to be United States Ambassador to Israel. All she said was that she was concerned about his appointment. It’s unknown whether her vote was motivated by Freidman’s strong pro-Israeli positions, or to support of Senator Schumer’s movement to oppose every nomination sent to the Senate by President Trump. In the April “Time 100” issue of Time Magazine, Senator Gillibrand wrote a piece supporting “four extraordinary women–Tamika Mallory, Bob Bland, Carmen Perez and Linda Sarsour” for organizing the Women’s March on Washington. All four of these women have supported the anti-Semite Louis Farrakhan, and all four of them have slandered Israel with false charges. Perhaps Gillibrand didn’t know about their hatred before she wrote in time, but she didn’t condemn them when it became national news. When Sarsour’s anti-Israel history was pointed out to Ms. Gillibrand by Rabbi Abraham Cooper of the Simon Wiesenthal Center, who asked Gillibrand to reconsider her endorsement of Sarsour, the NY Senator stuck to her support of the anti-Israel activist. Continuing in her quest to be loved by progressive Israel haters, Gillibrand even claimed the Netanyahu didn’t have a vision for peace. Senator Gillibrand is a smart person she knows very well about Netanyahu’s idea of peace. As a sitting Senator, she sat in the House chamber in 2011 to hear Netanyahu lay out his vision for peace. But Gillibrand needed to attack Netanyahu to please the anti-Israel progressives who control the Democratic Party, and perhaps to please her Iranian donors (her campaigns have been supported by the Iranian American Political Action Committee (IAPAC) and by the pro-Iran lobby’s Hassan Nemazee. Maybe Gillibrand doesn’t realize that if she wins a Presidential Election in 2020, she will miss the last four years of her term. But if she doesn’t know it, Gillibrand isn’t smart enough for the White House or the Senate. And if she does know it, she is a liar. 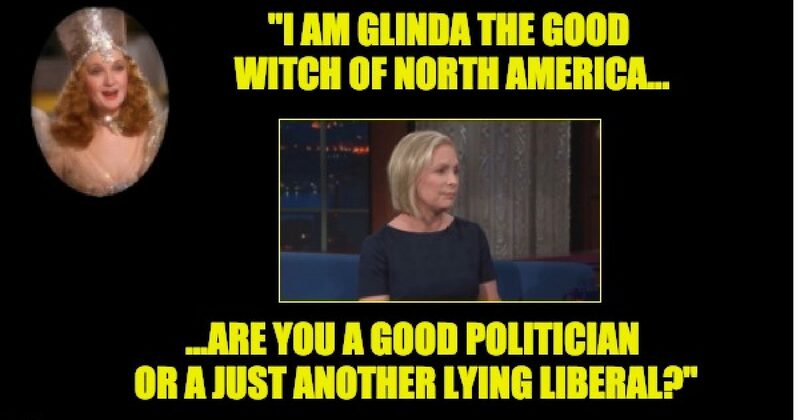 So when Gillibrand told Stephen Colbert she was running for POTUS she should have identified which Kirsten Gillibrand was running, the one who wants to abolish ICE, wants more restrictions on guns, supports Farrakhan’s anti-Semites, and takes anti-Israel positions, and voted for the Iran deal? Or the one who rejected amnesty for illegal aliens, promised to protect gun rights, bashed Hagel for his anti-Israel positions, and announced there should be no daylight between the U.S. and Israel, and promised not to run for President in 2020? Who knows? Certainly, with all her position changes, voters can’t know.